New Rochelle, NY, July 3, 2018–Prior to performing a medical procedure, physicians are increasingly relying on access to 3D printed models created using patient-specific medical data. Unfortunately, current 3D data processing workflows can be extremely time consuming, and frequently, the resulting 3D-printed models fail to accurately depict the anatomical details of interest. Motivated by these inherent limitations, an international team of researchers describes a rapid method for creating extremely detailed physical models directly from volumetric data stacks in an article published in 3D Printing and Additive Manufacturing, a peer-reviewed journal from Mary Ann Liebert, Inc., publishers . 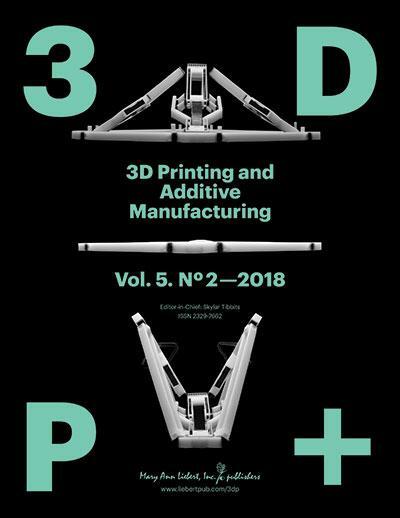 The article is available free on the 3D Printing and Additive Manufacturing website through August 3, 2018. The bitmap-based workflow relies on the use of cross-sectional image stacks – images acquired for diagnostic purposes or in advance of a surgical procedure, for example. These bitmap slices can be processed using standard photo editing workflows and are then fed directly into an ink jet-like 3D printer, resulting in extremely detailed physical models with the ability to incorporate grayscale, transparency, or mechanical property gradients, and thus more closely mimic the patient's specific anatomy.